Go to original pattern for design DROPS 62-7. 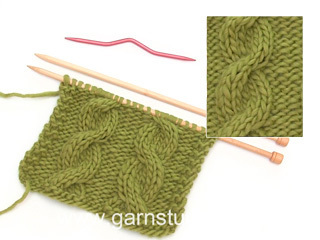 DROPS 5 mm circular and double pointed needles, or size needed to obtain correct gauge. 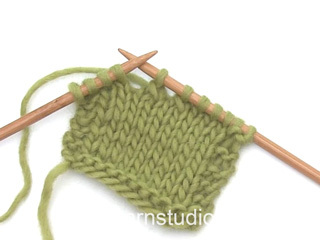 Gauge: 17 sts x 21 rows in stockinette st = 10 x 10 cm. 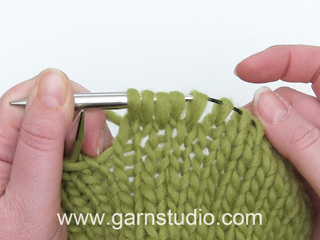 Garter Stitch, when knitting in the round: *Rnd 1, knit. Rnd 2, purl *. Repeat from * - *. Rib: * K 3, P 3 *. Repeat from *-*. 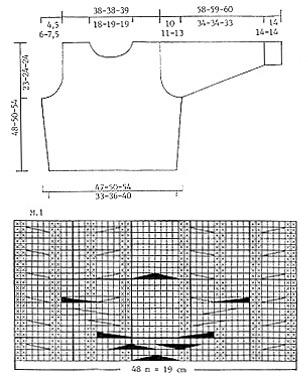 Pattern: See chart (1 chart = 1 repeat). The pattern is seen from the right side. Before 4 edge sts: K 2 tog. Body: Cast on 112-124-136 sts on circular needles with: 1 strand Karisma + 1 strand Cotton Viscose (= 2 strands). Join and knit 2 rows garter st. Attach a marker on each side, front and back each = 56-62-68 sts. Knit 2 more rows garter st, and on the second row increase 16 sts evenly distributed over the center 32-32-32 sts on the front = 72-78-84 sts front, back = 56-62-68 sts, a total of 128-140-152 sts on the needles. 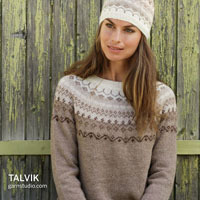 Back: 56-62-68 sts stockinette st.
= 176-188-200 sts. When the work measures 25-26-30 cm bind off 2-4-5 sts on each side of the markers for armhole and knit the rest of each part separately. Front: = 92-94-98 sts. Dec 1 st for armhole every other row inside 4 edge sts (which are knit in stockinette st) 6-7-8 times = 80-80-82 sts. When the work measures 40-42-46 cm dec 16 sts evenly distributed over the center 38-40-40 sts, then bind off the center 14-16-16 sts for the neck on the next row. Bind off at each neck edge every other row: 3 sts 1 time, 2 sts 2 times, 1 st 1 time. 17-16-17 sts remain on the shoulder. Bind off when the work measures 48-50-54 cm. Back: = 76-78-82 sts. Bind off for armhole as on the front = 64-64-66 sts. When the work measures 46-48-52 cm bind off the center 26-28-28 sts for the neck. Bind off 2 sts at each neck edge on the next row. 17-16-17 sts remain on the shoulder. Bind off when the work measures 48-50-54 cm. = 74-76-76 sts. When the work measures 48-48-47 cm bind off 2 sts each side of marker and knit the rest of the work back and forth on the needles. Bind off on each side for sleeve cap every other row: 3 sts 2 times, 2 sts 3 times, then dec 1 st on each side until the work measures 56-57-58 cm, then bind off 3 sts on each side until the work measures 58-59-60 cm, bind off. Assembly: Sew the shoulder seams. Pick up approx. 96-102-108 sts (divisible by 6 sts) around the neck on double pointed needles with 1 strand Karisma + 1 strand Cotton Viscose. Join and change to 3 strands Cotton Viscose and P 1 row (right side row) then K 1 row. 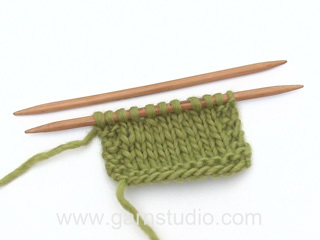 Change to 1 strand Karisma + 1 strand Cotton Viscose, knit rib, placing 3 purl sts at the center front. When the work measures approx. 8 cm bind off 1 st at the center front (the center st of the 3 purl sts), and knit the rest of the neck back and forth on the needles, knitting the outermost sts on each side at the center front in rib. When the neck measures 12 cm bind off loosely in rib. Sew in the sleeves.